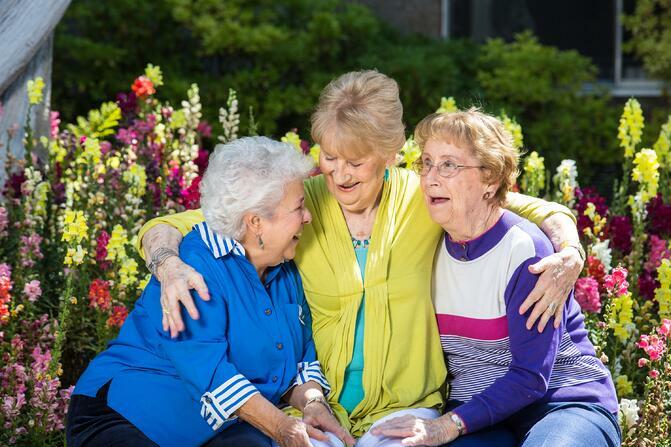 Senior living can offer parents grief support and opportunities to make new friends. Carole Malinowski, 83, and her husband Lou couldn’t wait to move into their sunny cottage at Windsor, a HumanGood senior living community in Glendale, California. Sure, they knew they’d miss their home of 47 years—the one with the snappy red door—but they wouldn’t miss all those stairs and the never-ending yard work. They couldn’t wait to make new friends and take advantage of the activities at Windsor. That’s when the worst happened. With the moving van still in the driveway of their old house, Lou died suddenly. Excitement turned to disbelief and then to grief. Carole had to leave everything familiar behind, go from being part of a couple for more than 60 years to a widow in a new environment—and instantly make arrangements for the funeral. Dealing with grief is gut-wrenching no matter where a person resides. However, senior living communities can provide built-in support systems and a family-like feel that may lessen residents’ heartache and give adult children peace of mind, knowing that their parent isn’t alone. It also helped that Malinowski threw herself into a variety of activities at Windsor. She is now vice president of the Residents Association, co-editor of the community newsletter and founder of the Windsor Warblers women’s chorus. Puff’s grandmother was living in a retirement home when her husband died. To move forward, she reached out to the other female residents, tried exercises like tai chi, volunteered and attended group outings. The group isn’t limited to people who have experienced the death of a loved one but is open to anyone mourning a loss. In 2009, Jim LeMay and his wife, Mary, moved to a one-bedroom home in residential living at Regents Point. Eighteen months later, Mary was diagnosed with dementia. Neighbors would find her wandering the corridors and gently bring her home. Burgoyne invited Jim to join Transitions. He remained in the group as Mary moved to memory care and then to skilled nursing before her passing in 2013. Malinowski also appreciates her rich, albeit changed, life. Naturally, she is heartbroken that her husband never had a chance to join her at Windsor. But she is deeply engaged in the community and says she can see how far she’s come since that first, fateful day. Starting the conversation with your aging parents about transitioning to a senior living community.